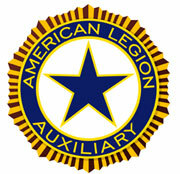 The American Legion Auxilary Chili Post 1830 meets at the post home on the second Tues of each month! Meetings start at 7:00 pm, and generally last 1 hour. If you are interested in joining the Auxilary at post 1830, then please attend one of these meetings to join or transfer in. December 11th, 2018 @ 7:00 pm, Christmas Dinner before meeting at 6:PM. Jan 8th, 2019 @ 7:00PM. March 12th, 2019 @ 7:00pm. Please clicl on emblem to visit National Aux. Website. Please click here to go to Dept. of N.Y.'s website. * A woman who is eligible for membership in the American Legion. * The Mother, Wife, Daughter, Sister, Granddaughter, Great grand-daughter, or Grandmother of members (both male & female) of the American Legion, & deceased veteran who served in the United States Armed Forces during the listed war periods. (See application form or link to the American Legion site). * Step relatives are also eligible. * Are you under the age of 18??? You can also join as a Junior member. See what is available when you go to: http:/www.legion-aux.org/membership/docs/bec_jr.html/. For a list of post officers, please see the Post Officers page on this website! * CHILDREN & YOUTH: We make monetary donations and many volunteer hours. * VETERAN'S AFFAIRS & REHABILITATION: Many visit VA hospitals, cooking meals for less fortunate vets. * DONATING FOOD and hours to Rochester Outpatient Day Care Center. * DONATING CHRISTMAS gifts and food for our Out Patient and hospitalized veterans. * Community Service; we make many donations to local charities and volunteer hours. * Americanism is another great program. We show our pride in being an American every day. These events take many volunteer hours! The American Legion Auxiliary does so many wonderful things it's no wonder we are the largest Patriotic Women's Organization in the world!!"